I like eggplants a lot but, they do need quite a bit of oil to cook. They absorb oils like sponge!! So, instead of chopping and sauteing them in oil, I have decided to roast the whole eggplant with only a few drizzles of oil. It's much more healthier to cook this way. Preheat the oven at 205˚C (400˚F). 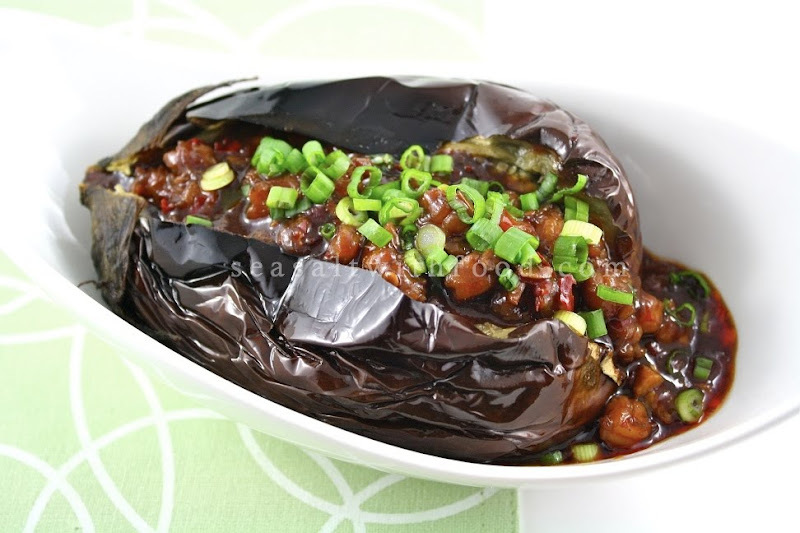 Drizzle the eggplant with some peanut oil and wrap in a tin foil. Roast the eggplant for about 20 minutes. 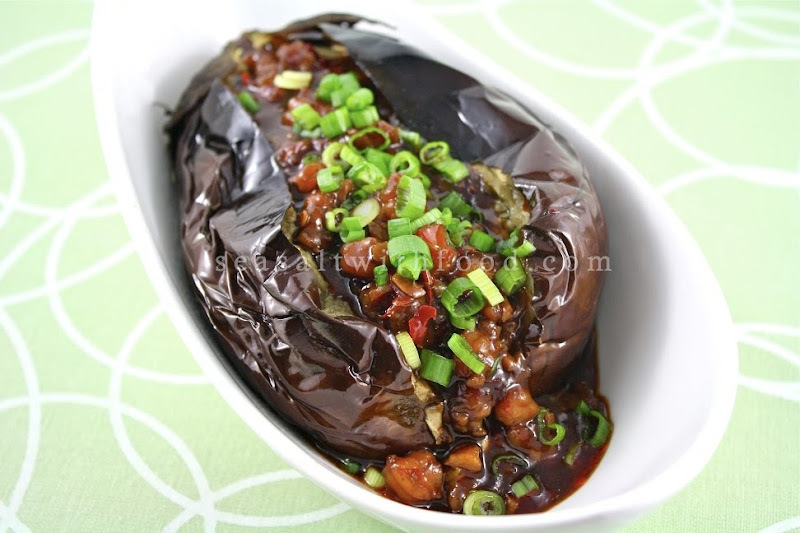 Then open the tin foil and roast the eggplant for another 5 to 10 minutes until they are soft. Meanwhile, marinate the prawns with light soy sauce, dark soy sauce, chinese cooking wine, oyster sauce, sesame oil and corn flour for about 10 minutes. In a wok and a moderate heat, saute shallots until they are lightly brown. Add the garlic and saute for another minute. Then add the marinate prawns. Cook the prawns until they are pink in color. Then add the chili sauce, some ground white pepper and stir quickly. Add the water and bring the sauce to a boil. 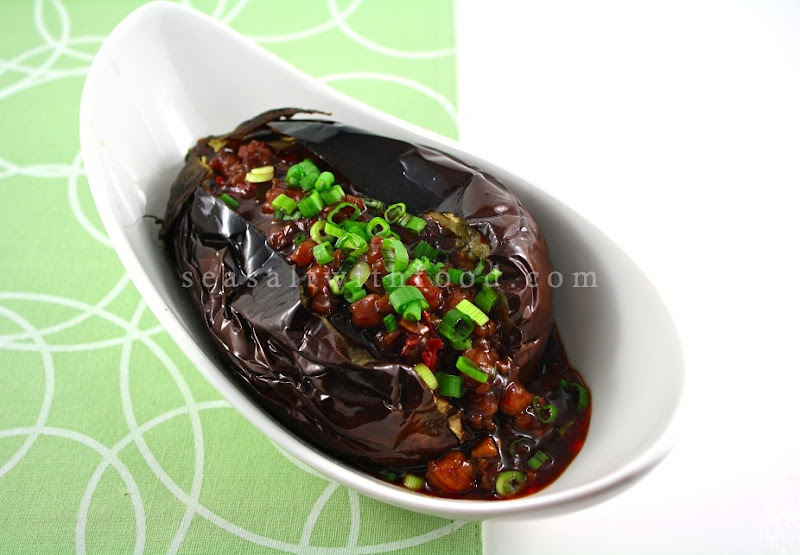 To serve, slit the eggplant open and spoon over the sauce and top it with some chopped scallions. Serve immediately. I love the idea of roasting the eggplant. They look so great with the bean sauce. What a spectacular eggplant dish. I do not have eggplant ideas at all: have to borrow this. Bookmarked: thanks!